For the past decade and a bit more Ashtanga Yoga has been my ‘thing’. It started as a class I dropped into after work once or twice a week, developed into a hobby, evolved into a life style. For anyone out there who has caught the yoga bug, you won’t disbelieve me when I say that for a while it became all consuming. My relationship with yoga affected pretty much everything; eating, drinking, sleeping, socialising or rather not socialising. Life was turned upside down & inside out and there wasn’t time for much else. Like any relationship, my connection with yoga has changed along the way. I remain passionate & dedicated to the practice however the initial fixation has lessened. These days Ihave more of a balanced approach, yoga remains a constant & now it gives me space for other ‘things’. 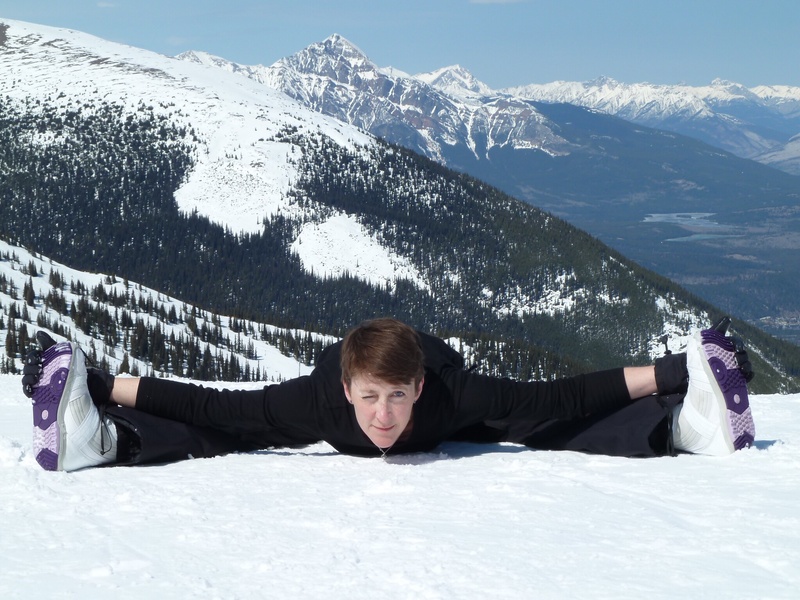 With this in mind, last March I stepped off my mat & fastened my feet to a snowboard. This may not seem like a major deal for many,but for me, it was a huge step out of my comfort zone – HUGE! Everything felt alien; layers of thermals, woollies, snow pants & jacket, gloves, helmet, goggles & boots. I was used to being barefoot on a yoga mat, wearing minimal yoga clothes chosen to be practical, comfortable & most importantly unnoticed during practice. In stark contrast, my snow gear felt wrong; heavy, bulky & cumbersome. And then to further impinge my freedom of movement I had to fasten my boot clad feet to the blooming snowboard! To be fair, it didn’t take that long to get familiar with the gear or the continual fastening & unfastening of the bindings. The real challenge was to start sliding on snow. Then again, thinking back, the first hurdle was getting on & off the chair lifts. Everything was difficult & I mean everything. I stuck with it & after a few daysstarted to make headway. The worries about the chair lifts faded as I got used to them & my attention shifted to working on my technique. I soon discovered that losing focus usually resulted in a fall. The same happened when I got tired, I had to be more aware of my energy levels dropping before I dropped. 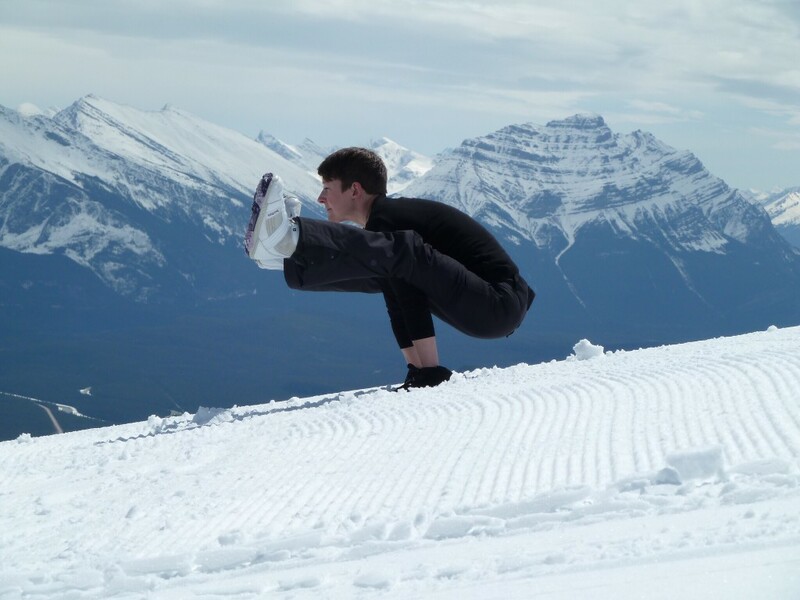 More & more I started to realise how many parallels there were between snowboarding & yoga. On a physical level they both require strength, stability, flexibility & agility. Mentally & emotionally the comparison was endless; patience versus impatience, trust (in me & my instructor), confidence, doubt, joy,frustration, exasperation, exhilaration, concentration, distraction, delight, fear, excitement…. You name it I thought or felt it in bag loads. It was uncanny, the more days I spent on snow, the more similarities I found. I’ve often described my yoga practice as a process of 2 steps forward & 1 back, or vice versa. When I am given anew, convoluted (AKA crazy!!) posture, without fail it highlights areas of the practice that I need to give more attention too. The practice requires a firm foundation in body, mind & spiritand this is continually put to test. It’s all too easy to skim over a posture that doesn’t feel so good but at some point it’ll come back to bite you on the bum. I learnt the very same lesson on snow. As my confidence grew I pushed the boundaries with steeper inclines & increasing speeds. Inevitably at some point I would lose control & end up in a heap mid run bringing me back to earth with a jolt (in all senses). As I trudged back to the nursery slope with a bruised ego & bottom a comment I heard in a yoga workshop once seemed all the more pertinent ‘you can’t do fast what you can’t do slow’. There is no hiding place when it comes to the groundwork albeit it on a mat or board, no stone can be left unturned. Never have the nowinfamous words of Guruji rung truer….